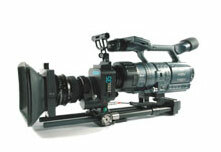 One of the cinematographers I may be working with recommended I hire one of these gizmos. It allows you to use 35mm film lenses on a Sony HDV camera, so you get film-look focus, depth of field, and film-quality images. I’m too scared to find out how much it costs. This entry was posted on Sunday, January 29th, 2006 at 12:58	and is filed under Production. You can follow any responses to this entry through the RSS 2.0 feed. You can leave a response, or trackback from your own site.